The PNC and NC chromosomes from otu mutants vary greatly in their length, level of polyteny, and banding pattern (see Fig. 3). 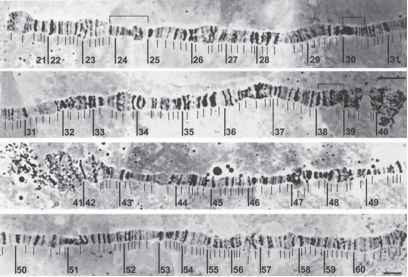 All the chromosomes can be classified by length into four major classes: "pompon" chromosomes (P) (see Fig. 3A,D) [for use of terms, see review by Zhimulev (26)], "half-pompons" (HP) (see Fig. 3B,C), "condensed" (C) (see Fig. 3G) and "normal" (N) (see Fig. 3E,F,H). P chromosomes are the shortest, HP are approximately twice as long as pompons (although still quite short), C chromosomes form a class that includes chromosomes with lengths between HP and N. Class N includes chromosomes with lengths close to those of salivary gland (SG) chromosomes. 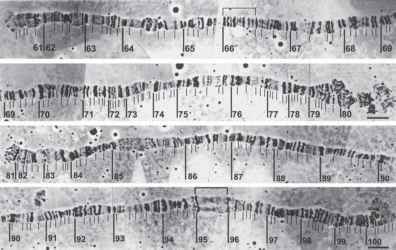 Also, several groups within each class were distinguished based on chromosome thickness (18). The NCs of otu7/otu7 flies contain mainly nuclei with P and HP chromosomes. The otu11 homozygotes show all the types of chromosome morphology. A heteroallelic combination of otu7/otu11 results in a shift of the distribution in the direction of the normal class (see Table 1). Few chromosomes of P and HP classes occur, the percentage of condensed and normal chromosomes increases, and a new group of N extra-large chromosomes appears (see Fig. 3H) (18). Initially, we worked with otu11 mutants, so photomaps were made using the N class chromosomes from NCs and PNCs of otu11/otu11 females (see Figs. 4-6). Thorough comparisons of the banding patterns of SG and PNC and NC chromosomes has revealed good correlations except for five regions, where no similarity occurs. These regions are shown by brackets on 2L at 24, 30, and 38 (see Fig. 5) and on 3L at 66, and on 3R at 95 (see Fig. 6). In many cases, the corresponding bands in SG chromosomes are split in PNC and NC chromosomes (21C1-2, 22C, 23D1-2, 23E1-2, 30AB, 48F, 51AB, 55C, 57E, 61C, 65D, 66E, 71A and 93F) (22,25,27). The PNC and NC chromosomes develop a few large and many very small puffs. The main large puffs are 3CD, 7E, 8C, 11B, 22F, 42AB, 47A, 61AB, and 79D (18,22,25,27). Telomeric puff 61AB is the largest (see Fig. 7G). 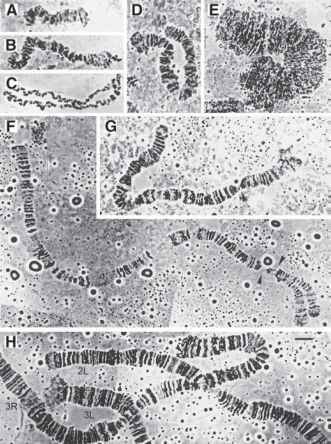 Chromosomes from the NCs of one egg chamber have the same puff pattern (see Fig. 7A-C), but chromosomes from different stages of egg chamber development show subtle differences in their puff patterns (see Fig. 7D-F) (Mal'ceva, unpublished data). To investigate the location of induction of ecdysteron-induced puffs in polytene chromosomes from NCs, ovaries from females of otu7/otu11 genotype were incubated for 2-6 h at 25 °C or 3-24 h at 16°C in ecdysteron-containing organ culture medium. In another experiment, preincubation of NCs in an ecdysteron-free medium for 12 or 6 h was followed by incubation with ecdysteron for 8 or 6 h, respectively. 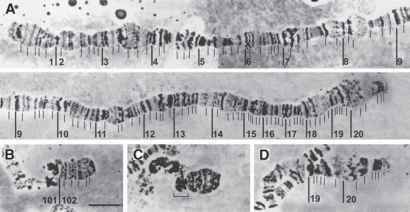 NC chromosomes did not form puffs in response to ecdysone under these experimental conditions (28). It is difficult to induce a heat-shock response in PNC and NC chromosomes. Flies homozygous for otu7 were temperature shocked to induce expression of the hsp genes, followed by in situ hybridization of the hsp26 probe to polytene chromosomes. In some PNC nuclei, a very faint signal was found (29). 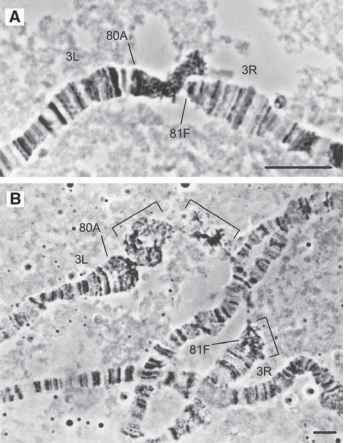 Long incubation in vitro of ovaries from otu7/otu11 flies in ecdysteron-containing medium causes formation of tiny hsp puffs in 63B, 67B, 83A, and 97D regions (28). unpublished data). An example of HP1 localization on a PNC polytene chromosome can be seen in Fig. 8. Pericentric regions of SG polytene chromosomes are usually involved in nonhomologous associations that result in a structure called the chromocenter. In PNC and NC polytene chromosomes, the chromocenter consists of blocks of polytenized material connected by tiny threads, which can be easily broken during squashing (see ref. 20, Fig. 8B). Sometimes, bands and even puffs can be seen inside these blocks (see Fig. 9) (27,31-33). The pericentric region of the X chromosome in PNC and NC contains a characteristic banding pattern in region 20A-F (see Fig. 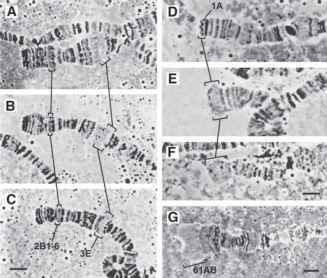 4D), which is rarely seen in SG chromosomes (27,31). Using a number of chromosome rearrangements and DNA clones with known localization in mitotic heterochromatin, a correspondence was found between polytenized material in PNC autosomes and differentially stained blocks in mitotic chromosomes. The polytenized material in pericentric regions of chromosomes 2 and 3 originates from proximal mitotic heterochromatin rather than proximal euchromatin or material from eu-heterochromatic junction regions (32-34, Domanitskaya and Koryakov, unpublished data). The genetic inactivation of euchromatic genes placed next to pericentric hetero-chromatin by a chromosomal rearrangement is accompanied by the compaction of corresponding euchromatic chromosome regions (so-called position-effect variegation). A comparative study of the manifestation of position-effect variegation for the polytene chromosomes of SGs and NCs was made using the Dp(1;1)pn2b and Dp(1;f)1337 rearrangements. The percentage frequencies of block formation in the SG and NC nuclei for Dp(1;1)pn2b were 92.6% vs 15.8%, respectively; for Dp(1;f)1337, these values were 56.8% vs 9.7%, respectively. Therefore, pericentric heterochromatin belonging to germ-line chromosomes is in a configuration that is far less likely to inactivate inserted segments of euchromatin than is heterochromatin from somatic chromosomes (18). In polytene chromosomes, there are several sites, which, because of their characteristics, are believed to be the sites of intercalary heterochromatin (35). 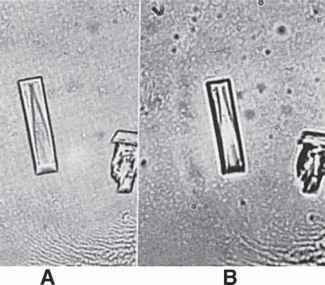 Usually, they form weak points where chromosome breaks occur, and they tend to form ectopic contacts with nonhomologous sites and pericentric regions of chromosomes. In PNC chromosomes, breaks were observed in at least 11 sites of the X chromosome, 8 sites of chromosome 2L, 5 sites of 2R, 5 sites of 3L, and 13 sites of 3R, but their frequency is substantially lower in PNC chromosomes than in those from SG cells. In regions 36C, 36D, 39E, and 56F, frequencies of breaks are comparable with those in SG chromosomes (see Figs. 3F,G and 5) (27; Koryakov, unpublished data). The frequency of formation of ectopic contacts between different PNC chromosome regions is 10 times less than in the polytene chromosomes of SG cells. The regions that form ectopic contacts in PNC chromosomes are 2C, 3AB, 9A, 10A, 11A, 11D, 12D, 12E, 26C, 28D, 48D, 49A, 58A, 58F, 59A, 60E, 66E, 67CD, 67E, 69D, 70A, 75F, 76B, 98D, and 99A (27). splitting of individual homologs is very rare in NC chromosomes of otu mutants, with the exception of otu11/otu14 (Mal'ceva, unpublished data). Asynapsis between homologs in PNC chromosomes in all of these mutants is much more frequent than in SG chromosomes, especially in regions 19-20, 39-40, 41-42, 79-80, and 81 (27). From the above, it is clear that polytene chromosomes of otu mutants can serve as a useful model for studying features of gene expression and eu- and heterochromatin behavior.